Spring Fling Coffee Swap, originally uploaded by lyndsey-jane. Wow! What can I say, this was the most awesome parcel ever. My partner was Kat (who did a great job of not letting on who she was considering we were still in contact from when I was her spoiler in the Hot Cocoa Swap). 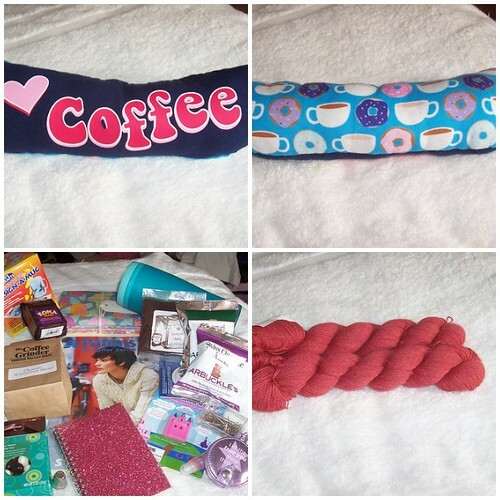 The swap requirements were coffee, yarn and a handmade item. Kat made me a lovely coffee themed lavender scented cushion. Which takes pride of place on my pillow. The yarn is Knitpicks Alpaca Cloud and lovely soft laceweight perfect for the lace shawl patterns in my Ravelry queue. Among the copious amounts of other stuff there is the Street Smart pattern book from Patons (which has the Must Have Cardigan in it), a portable coffee mug, thimbles and t-pins, mirror & lipgloss keychain, notebook, coffee (lots of coffee) and a design a mug. There was also chocolates and sweets but Karl and I have already eaten them. He is now a big fan of Swedish Fish. Thank Kat you totally rock!!!! Spring into Pink Swap Parcel, originally uploaded by lyndsey-jane. So this week, they are asking us of we are changing are knitting because of spring. I have to say that I am. I have very little on the needles at the moment, (awaiting needles) but I will be casting on a shawl or two (this isn’t due to the onset of spring, but due to my mums wedding in Sept. and a possible christening in late summer) and Juliet v.2, which will be in Rowan Cotton Rope and is perfect for the warmer weather. I will however, be casting on for a sweater in alpaca. The Mirepoix bodice – not a quick knit, so I figure if I start now it should be ready in time for the colder weather. I do prefer to knit shawls and smaller lighter items over the warmer weather as there is less bulk sitting in my lap keeping my legs warm. I also change my coffee drinking habits in the warmer weather and cold brew coffee which I then use to make Iced Coffee with vanilla syrup and starbuck caramel sauce – so moreish! So this week we had to look to see if anyone else shared the same taste in coffee as me. I found out that Nancy from Days Go By also likes medium to dark roasts and also enjoys flavoured coffees. We also had to find something interesting about them we had found on their blog – well Nancy has cat called Reggae who has recently been poorly but thankfully he is on the mend now. In knitting news I have 2 FO’s, my tree jacket is finished blocked and all ready for me to wear tomorrow and the Swallowtail Shawl just needs blocking. I think I will cast on (again) for Juliet, this time in much smaller size. We had Karl’s family up yesterday for his birthday and went out for lunch – but stupid me left the camara at home. I am hoping to get some photos of him tomorrow in his Cobblestone. Off to sleep some more as I have lots of revision for an exam on wednesday. I actually bought some coffee yesterday. I medium to strong roast, I do like to buy Fair Trade if I can, and organic if the price isn’t too high. My fave starbucks coffee at the moment is their Cinnamon Dolce Latte – to die for! Both!!! I do have a caffeine problem, I drink a lot of diet coke too. In the morning it’s definitely more for the caffeine but I do really enjoy a nice large cup of coffee. I like flavoured coffee;s (esp. vanilla, hazelnut and cinnamon) and like syrups in my coffee. I have vanilla in house always and have been trying to find some sugar-free syrups, but they seem rare in this country, in anything other than 1l bottles. Large mug! I have a couple of faves,both from Starbucks. One was gifted to me in a swap the other came with my one-cup filter. I use my travel mug a lot as I drink a cup on the bus on the way to University and then get it filled at Starbucks. I would love a larger travel mug (mine is Starbucks tall size) and I would love a grande size one. 7. Describe your perfect cup – not JUST the coffee, but how you’d enjoy it! Medium to strong roast latte with cinnamon syrup and cinnamon sprinkled on it. Drunk from a large thick mug I can wrap my hands around. I would be sitting somewhere nice knitting with my mum and having a gossip. Most importantly she would have allowed me to pay for it. On a plate next to me would be a cinnamon danish. 8. You’re sitting down to enjoy a nice cup in the local coffee shop, knitting bag in hand, iPod all tuned up – or maybe you’re there with a few friends for knit night! What treat do you pick up to enjoy with your coffee? A sweet, rich brownie, or something more healthy? How about a salty treat? What goes best with that great cup and company? See above – Cinnamon danish. Merino, silk, cashmere, alpaca – anything natural except angora and mohair (i’m allergic) I’m knitting a shawl with some malabrigo lace at the moment and love it. I plan to cast on for a sweater soon so will update when I’ve decided what to stash yarn to use and what pattern. 4. What are your favorite colors in yarns? What about those that you’d never find in your stash? I got some Knitpicks Harmony needles (options & dpns) for christmas and haven’t used anything else since. I find metal and plastic hurt my hands, so prefer wood or bamboo – but I do love my harmonys. 6. Are there any particular notions you absolute do NOT need? Some of us swap a lot – are you sure that you have enough tape measures to last your lifetime? Enough stitch markers to mark every stitch of a 10 foot wide afghan? Still don’t have too much of anything. I can always use T-pins if I have partner from US/Canada as I can’t seem to find anywhere in UK that sells them and they are perfect for blocking. 7. You walk into the yarn shop and have exactly and only enough money to purchase 2 skeins of yarn in their 2 for 20 special they have going..The choices are a soft, thick cotton/viscose blend in your favorite colors, slightly variegated..a beautiful sock yarn that’s just squishy and sproingy in your hands.. a soft, worsted weight wool like malabrigo.. and a lovely bamboo blend with colors to just die for. Which do you walk out the door with? I would be very close between sock yarn or worsted weight (but only if it was a soft as malabrigo). I love sock yarn but do have quite a bit (you can never have too much) but it would have to be something very different/special. I’m loving lace at the moment so I would be disspointed there wasn’t any laceweight in the special. 1. We’re starting sign-ups on the first day of Spring – is it already truly Spring-like where you are? No!!!!! I’ve just go tback from opticians and its cold, windy and rainy. We have snow and very cold temperatures forecast for the Easter weekend. 2. What’s your favorite spring flower? Do you have one? Not a fan of real flowers as I have bad hayfever. I do however like floral things, especially those with big, bold, bright, modern flowers on. Being able to wear my crocs without getting cold, damp feet. Wearing bright colours and sitting in the sun eating lunch at university. 4. They’ve predicted a gorgeous day tomorrow – Sunny and about 65 with a nice breeze – how do you spend your day? Sitting by the river knitting and drinking ice coffee. 5. The day after, it’s going to be cooler and pouring down rain – does that impact your mood? How do you spend that day? what helps cheer you up? Snuggle up in a comfy place with a large cup of coffee and knit or sew. Fabric- I’ve just started sewing and quilting and my stash is very small. I’ve been swapping for a while. 5. List 3 of your favorite blogs – craft related or not – and tell us why you love them. UK Swap Parcel, originally uploaded by lyndsey-jane. How spoilt was I yesterday! Claire (and yes we do share the same blog template, just in case it confused you) sent me the most amazing UK Swap parcel, I love everything in it. Hotel Chocolat Liquid Chocolat (Kiss Mix – Caramel Flavour) which I had a cup of last night and is officially gorgeous!!! Tigger’s Little Book of Bounce – which has made me chuckle on several occasions. Lush Helping Hands – which is perfect as I was just running out of hand cream and is fantastic on my super super dry hands. 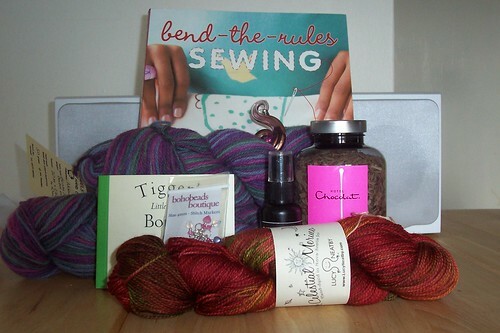 Bend the Rules Sewing by Amy Karol, this book has been on my amazon list for a while and it is so good. I plan doing some sewing over the next couple of days and once I’ve finished some sewing wips, I am going to make a couple of toy turtles from some fabric leftovers I have. Once i get the money the bank owe me (it’s a long story but they’ve owed me over £500 since January and I still haven’t received it, apparently the cheque should be with me by next week) I’m going fabric shopping. There are a couple of bags I want to make from the book and I’ve seen the most gorgeous fabric in John Lewis which I want to make a skirt and matching bag with. Also I’m going to look for some cute baby fabric as there is a pattern for baby bibs in the book which would be great for Karl’s brothers baby. Apparently his sister-in laws’ family have a habit of turning up 2-3 weeks early – Karl thought I should know so I could make sure stuff was finished, how thoughtful, I think! Do you remember my Juliet, well, I finally got some buttons for it today, tried it on to work out placement of said buttons, only to find – it’s too big. I plan a frogging session with it this weekend, I am going to re-knit it a couple of sizes smaller as I really like the pattern in the Rowan Cotton Rope and love the buttons I just bought. Luckily I hadn’t got around to weaving in all the ends – see laziness does have a use. Off to put the finishing touches to a couple of bags, hopefully I’ll have some sewing FOs soon.